This is a big year for my little man. He graduated from Pre-K and is headed off to Kindergarten! If you read along my blog at all, you may know that my little man has some different needs. Basically, words are in his head but he can’t get them out of his mouth. You could see how this might make going to school challenging. But you know what? He did it and he did super well with the support of his teacher and therapists. I wanted to make something really cute and personal for them this year. Paint- acrylic worked well for us. A couple different colors is nice. Canvas- We used an 8×10. A Gallery canvas with deep sides is nice since they it is wall hanging ready. Permanent ink pen or fine tip marker or printer- to produce poem and signature. Using white or another color of choice, cover the canvas background evenly with paint. Paint the sides as well. Let dry. Place a wood block or book underneath the canvas to provide a surface to press into. Alternately, you can use your own hand under the canvas when pressing down on it. 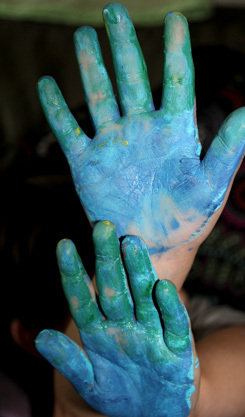 Using the foam or wide brush, paint the palm surface of your child’s hand with a thin coat of paint. Press a hand print onto the canvas where the petals of the flower will be. Repeat two or more times with the same color. You may repeat with a different color if desired. Be sure to turn the canvas, (or the hand) with each impression to get variation. At the bottom of the canvas, use finger lengths, painted green or desired color to make the grass. Once these are dry, go back in and add a center to the flower with finger prints and add some additional buds to the grass with finger prints as well. Thanks for helping me grow. It means more to me than you know. Confident in all I now know. You can seal the project with a spray acrylic coating or gel medium (or mod podge) once dried if desires. Voila! Hand print poem page. P.S. if you don’t want to do the whole paint thing, you could likewise write a little poem about growing and secure it to a Popsicle stick and add it to a cute plant as a gift! Lots of ideas! What a lovely, creative idea. Thank you! It was fun and fast and my little guy was very proud of it when he was done :). What more could I want?! The completed project is absolutely gorgeous – what a great gift idea!